THE CANADIAN PRESS -- MONTREAL - On the anniversary of the Air India bombings, Prime Minister Stephen Harper is looking both to the past and to the future. Harper is in Montreal today unveiling the last of four national memorials to the 1985 bombing victims. This new memorial in the waterfront community of Lachine, a polished black stone, follows three similar ones in Toronto, Ottawa and Vancouver. Harper says today -- the 26th anniversary of the bombings -- is a day to remember the worst terrorist attack in Canadian history. Three-hundred and thirty-one people were killed. But the federal government is also looking forward, with the creation of a new project to fight terrorism. The Kanishka project will provide funding for a wide range of initiatives designed to increase anti-terrorism knowledge -- including conferences, publications and major research projects. "Terrorism has not and will not undermine our way of life," Harper said. "Our society remains resilient because of the basic values that bind us and make us stronger -- freedom, democracy, human rights and the rule of law. . .
"The memory of the victims and the pain of their families strengthen our resolve to fight criminals and terrorists at home and abroad." Kanishka was a powerful Kushan emperor nearly 2,000 years ago; the plane bombed while making Air India's flight 182 was named after him. The five-year program will spend $10 million on counter-terrorism initiatives. 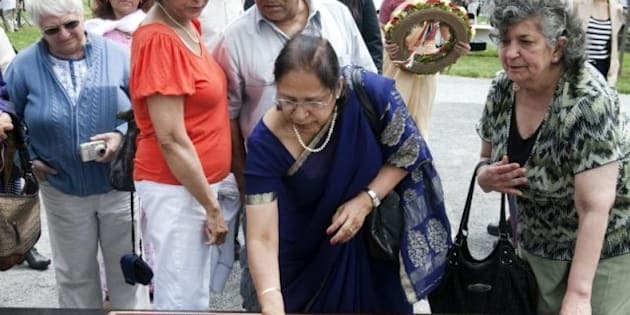 The announcement, and memorial unveiling, were made on the National Day of Remembrance for Victims of Terrorism -- an event proclaimed by the federal government and first observed on June 23, 2005.